November 24th, Rose Bowl. Pasadena. Hey Cal Alumni! Let’s make the Rose Bowl Bear Territory! Join Cal Alumni of Los Angeles Chapter and the Cal Alumni Club of Long Beach as they invade Pasadena at the official Cal Alumni Tailgate before the Cal vs UCLA game at the Rose Bowl! Athletic Director Mike Williams (Class of ’82) will be present, as well as a few other special guests from the University. Presented by the Cal Alumni of Los Angeles Chapter and the Cal Alumni Club of Long Beach. Attention all North County alums! We have a second venue for game day viewing, SpecHops Brewing Company located at 1280 Activity Dr Vista, CA 92081! This venue is also Cal owned (Stephanie Jahn Casperson, class of ’94), kid and dog friendly. Come watch the Cal vs. Colorado football game. kick-off at 11am. 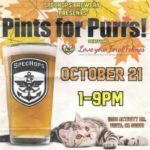 There will also be a fundraiser for feral cats called Pints for Purrs. Football, feral cats, beer specials, what a day!!! **This will not replace the viewing party at Waypoint Public for those Cal fans in the Downtown/Metro areas. We hope to see everyone at one viewing party or the other!! Attend this event in person at the Los Angeles Music Center to enjoy a hosted reception, enlightening discussion, and the chance to speak with former legislators and Cal faculty and officials about the nationwide trend of disinvestment in higher education. A group of die hard Cal football fans came out to support our team last Saturday to watch our beloved Bears defeat the Tar Heels of UNC. Saturday, Sept. 2nd was our first game viewing of the year at Park and Rec (in the area called the “Garage”) in University Heights. Owned by our very own John Pani (class of ’91), the address is 4612 Park Blvd., San Diego, CA 92116. Game time was 9:20 am sharp and was a private event for Cal fans only. Raffles, Corn Hole, and prizes! Many thanks to our devoted alumni, Athena Lai and Marisela Chavez, for seeing our students off to Berkeley on the Golden Bear Express!! We wish our students from San Diego a wonderful experience as they head off to their wonderful Cal journey. Go Bears!! 2017 CAA Leadership Award – volunteers needed! Cal alumni volunteers needed to interview incoming freshmen for the 2017 CAA Leadership Award. Interview date and timeframe: Saturday, June 24, 8:30 a.m. to 3:00 p.m.
Fall BIG 10/Pac-12 Happy Hour – Wednesday, September 20th. These events are really fun. If you want to hobnob with other Cal folks as well as alums from the other 25 schools, this is a great opportunity! Keep checking back for updates. See you there! The Fall BIG 10/Pac-12 Happy Hour will be Wednesday, September 20th, 5:30 -8:00 p.m.. 5:30 -8:00 p.m. at Elbowroom; 5225 Kearny Villa Rd, San Diego CA 92123. The restaurant will close for our event, wear your BIG 10/Pac-12 college gear. There will be free food and drink specials! Join us for one of the most fun events of the year (besides the Holiday Bowl!). This year Bocce is happening on the field at Qualcomm Stadium, don’t miss this once in a lifetime event! More details: http://www.holidaybowl.com/holiday-bowl-events/bocce-bash/. The Holiday Bowl is holding Early Bird pricing for Alumni foursomes – $1,000. Email gina@holidaybowl.com and let her know you want in on a fun day of golf. Thanks to our friends from the Rocky Mountain Golden Bears Club, some San Diego Bears were able to participate in the Bears on Skis trip to Breckenridge, CO in February 2015. UC Berkeley’s Golden Bear Orientation is part of a long tradition of welcoming new undergraduate students and their families and supporters to our campus. Orientation can provide the spark to positively affect a student’s years at Berkeley. We are thrilled to help our new Golden Bears begin at Berkeley on a sure path, to explore their passions, to understand the meaning of being a Berkeley student, and, of course, to have fun. Visit UC Berkeley’s Golden Bear Orientation Link to find out how you can help and to get more information.